Governor Deval Patrick offered on Friday to help end the epic Demoulas family showdown over the Market Basket grocery chain that has paralyzed its operations and hurt tens of thousands of employees and customers. In a letter to the company’s board of directors, Patrick said he would not take sides in the dispute. But he said he was willing to assist in negotiations if it would help get the company’s employees back to work. Meanwhile, the company’s internal battle continued with an exchange of sharply worded statements late Friday. Three members of the Market Basket’s board said they had asked former president Arthur T. Demoulas and his management team to return in an informal capacity to help rebuild the company’s tattered operations. But the directors said they would not put Demoulas back in charge of Market Basket. The bitter Market Basket fight has crippled the operations of the company, which continues to lose millions of dollars a day. An employee walk-out in response to Demoulas’s firing last month has left stores with little food and a steep decline in business. Demoulas has offered to buy the shares of rival family members. But the company’s board, controlled by his cousin, Arthur S. Demoulas, has said only that it is evaluating several offers. The parent company of the Hannaford Bros. Co., Delhaize Group SA, has also emerged as a serious bidder in recent days, according to people familiar with the discussions. Patrick’s offer to intervene was yet another turn in an extraordinary saga. A former Harvard Business School professor who once served on Market Basket’s board urged Patrick to go even further, suggesting that he use the state’s eminent domain powers to take the company, which has a market value in the billions, and sell it to the highest bidder. “I realize it’s not a conventional recommendation, but this is a family that’s been engaged in court battles for the better part of two decades,” said Nabil El-Hage, a specialist in corporate governance who joined the board in 2012. He resigned his post last September, concluding he could not help the company get over the family fight that was undermining it. “In my opinion, there is no hope for reconciliation,” said El-Hage, adding that using eminent domain would allow the Demoulases to get fair market value for their ownership, while also delivering the company from the family’s dysfunction. The company’s board has been evaluating offers to buy it, including one from Arthur T. Demoulas, but there is no sign that a deal is imminent. Patrick did not respond directly to El-Hage’s suggestion. Until Friday, the governor had rebuffed suggestions that he should intervene in the matter, asserting that government had no business interfering in a feud about a family business. His position stood in stark contrast to statements by New Hampshire Governor Maggie Hassan, who has publicly urged Market Basket to end a stalemate putting more than 9,000 jobs at risk in her state. 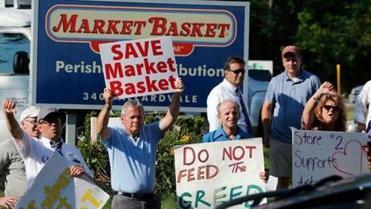 Market Basket has 25,000 employees and 71 stores in Massachusetts, New Hampshire, and Maine. Over the years, the two Arthur Demoulas cousins have tangled many times over management of the company and other matters. Arthur S. and his siblings won a legal ruling in the 1990s that found Arthur T.’s father defrauded them of shares in the company worth hundreds of millions of dollars. In their statement yesterday, the three directors of the company, Eric Gebaide, Keith Cowan, and Ronald Weiner, said they have been working “around-the-clock” trying to negotiate a sale of the company while also limiting the damage done to the business, its employees, and customers. Though Patrick had expressed reluctance to get involved in a private corporate battle, he did intervene in a prior dispute about the actions of the Hyatt hotel chain. In 2009, he weighed in on the abrupt firing of 100 housekeepers at the three Boston-area Hyatts. Patrick called the Chicago-based chain’s chief executive, Mark Hoplamazian, to ask him to reconsider the decision to outsource the work. In his letter to the Market Basket Board, Patrick emphasized that he does not have an opinion on who should serve as the company’s chief executive and that there are many details of the negotiations that should remain private.